Our theme for this baby shower was spring. 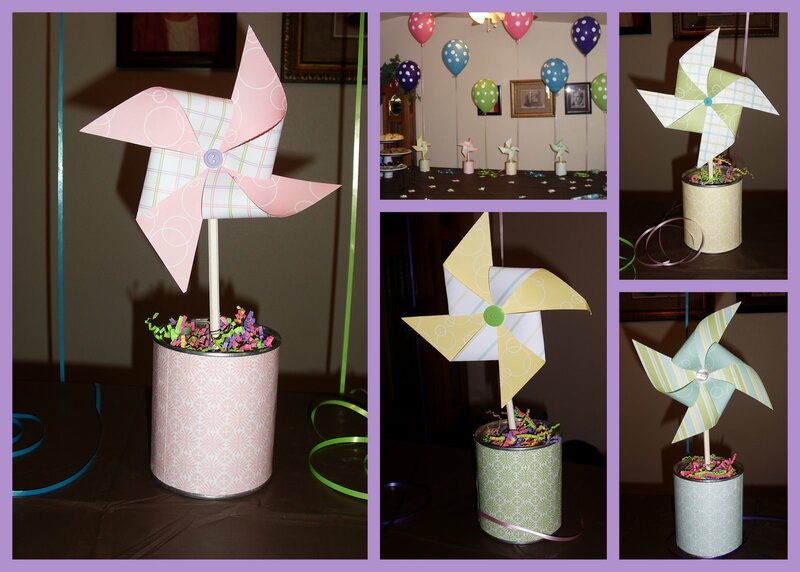 Lot's of pastel colors,flowers and pinwheels. Look closely at the table, there are tons of little 2 inch pinwheels on the table. but we ran out of time, so we just scattered them on the table. The tins were empty Stephen's Cocoa Honeyville Farms smoothie mix cans. We just modge podged coordinating paper to the tins. To make the little pinwheels we cut the paper to 2 inch squares. Then simply cut the four corners in at about 1 inch deep. Then you fold the four corners down and glue them. We used buttons to put at the center. The big pinwheel is a 6 inch square. We attached flat thumbtacks to the back. We painted regular #2 pencils, for the stick. Stick your thumbtack in the eraser and your done! They are functional and spin. and top that with some shredded paper!! These could be used for a variety of things. Heck, my kids love pinwheels. It's a great afternoon craft!